PGA MERCHANDISE SHOW, ORLANDO, Fla., Jan. 22, 2019 – Trojan Battery Co., LLC, the world’s leading manufacturer of Motive and Solar deep-cycle batteries, and Columbia Vehicle Group Inc. today announced a strategic relationship to offer Trillium™, Trojan’s intelligent lithium power solutions, for their entire line of Tomberlin electric vehicles for golf, personal transport and utility use. “By joining forces with a battery pioneer such as Trojan, Tomberlin is excited to embark on this technology journey to offer lithium options in all our electric vehicles,” said Greg Breckley, director of business development for Columbia Vehicle Group. 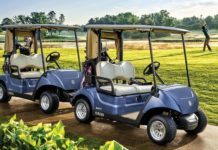 “Our strategic alliance with Trojan will strengthen our relationship as we work together to provide the most advanced, golf, utility and personal transport vehicles with a sophisticated lithium battery solution. Our team thoroughly tested Trillium and deemed it as the best lithium option due to its robustness, enhanced safety features and extended life,” added Breckley. 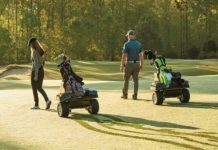 While lead acid batteries will continue to be the leading and most cost-effective battery technology for the golf industry in the coming years, recent advancements in other battery technologies, such as lithium, are creating niche solutions for a select group of customers in certain environments. 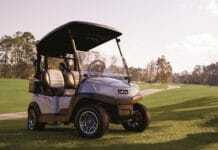 Leveraging Trojan’s close to 100 years of battery expertise and Columbia’s over 70 years of golf industry expertise, this strategic alliance will focus on developing an optimized power solution designed specifically for demanding and unique applications. 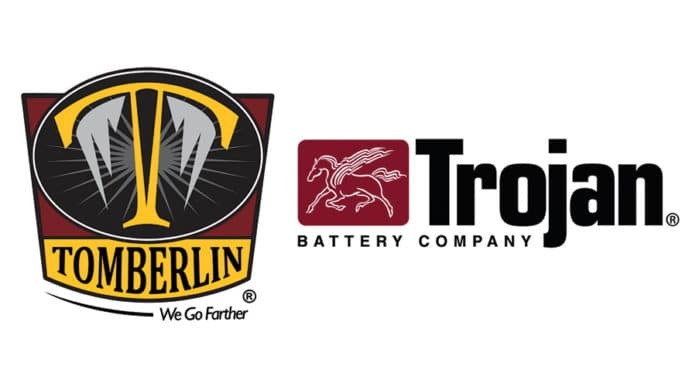 “Tomberlin is the first OEM to offer Trillium in their vehicles, and we are thrilled that Tomberlin selected Trojan as their choice for a lithium-ion solution,” said Brad Bisaillon, director of strategic accounts for Trojan. Their internal testing team determined that Trillium was the superior offering in its class. As the first light electric vehicle OEM to embrace lithium technology throughout their entire product line, the availability of Trillium sets them apart from other OEM’s . Tomberlin will be debuting their Trillium offering in various Emerge models at the PGA Merchandise Show in Orlando, FL beginning on January 23. Trojan will also be showcasing Trillium in booth 3024. Based in Reedsburg, Wisconsin, Columbia Vehicle Group is a premier electric vehicle manufacturer whose history dates back to 1946. Columbia Vehicle Group Inc. markets products for private use under the Tomberlin brand and vehicles built for work under the Columbia brand. Tomberlin designs, manufactures and distributes advanced electric vehicles targeting neighborhood and close-in commuting use. Tomberlin utilizes a community-based distribution network throughout the USA, South America, Europe and Asia. To learn more about Tomberlin, visit www.tomberlinusa.com. 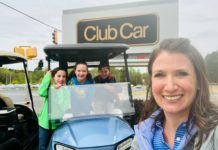 Columbia produces electric vehicles for commercial and industrial applications that include models that move from 1 to 24 people, carry up to 6,000 pounds of payload, tow up to 16,000 pounds and travel up to 25 miles per hour. To learn more about Columbia, visit www.columbiavehicles.com. 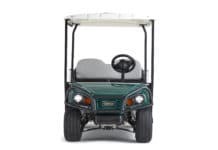 Trojan Battery is the world’s leading manufacturer of deep-cycle energy storage solutions for Motive and Stationary applications and a battery technology pioneer, having built the first golf car battery in 1952. Trojan batteries provide power for a wide variety of Motive and Stationary applications that require deep-cycle battery performance, including mobile elevated work platform/MEWP, airport ground support equipment, floor cleaning machines, golf and utility vehicles, marine/RV, material handling, oil/gas and renewable energy industries. Founded in 1925, the company is ISO 9001:2015 certified with operations in California and Georgia and maintains two of the largest and most extensive research and development centers in North America, dedicated to engineering new and advanced battery technology. 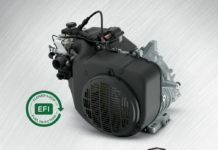 For more information visit www.trojanbattery.com.